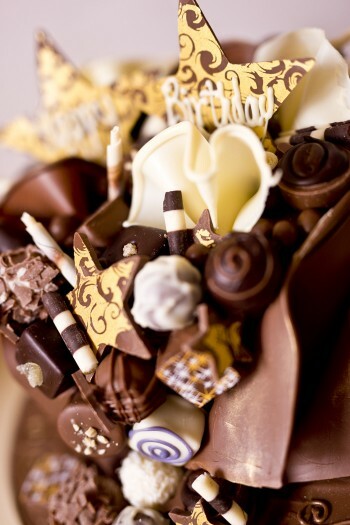 The cake is wrapped in your choice of milk, dark or white chocolate with a selection of handmade truffles and chocolate decorations filling the top and cascading down the front of the cake. Please let us know which type of chocolate you would like your cake to be wrapped in when you order. The top of the cake is decorated with chocolate stars reading ‘Happy Birthday’. We can personalise the cake with a name – please let us know your message when you order.